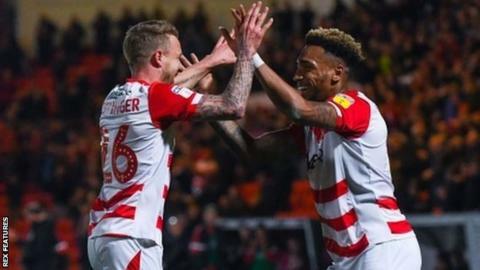 Doncaster Rovers climbed into the League One play-off places with a 4-1 beating of relegation-threatened Bristol Rovers at the Keepmoat Stadium. After midfielder James Coppinger struck twice in the first 12 minutes, Mallik Wilks made it 3-0 by the break. Kieran Sadlier struck the fourth a minute into the second half, before Jonson Clarke-Harris pulled one back with a 66th-minute penalty. Doncaster go sixth, but Bristol Rovers remain just three points clear of trouble. Coppinger gave the home side the lead after just three minutes when his tame effort squirmed under visiting goalkeeper Jack Bonham, who should have done better. But the 38-year-old veteran - now just 12 short of 100 career goals - needed no help with his second, firing home a low effort from 20 yards. After Wilks converted from 12 yards after 31 minutes, Sadlier's 30-yard stunner quickly added to Doncaster's deserved lead. Clarke-Harris pulled one back from the penalty spot after 66 minutes after being shoved to the ground inside the area, but it was too little, too late for the visitors. They are now looking over their shoulders after conceding four goals to Doncaster for the second time this season.